Editor’s note: This is the second of several reports about the effect of the Chechen conflict on Russia on the 10th anniversary of the start of the first war. Federal troops remain almost as ill-equipped to fight a low-intensity conflict as they were a decade ago when the first war began in Chechnya, and military strategists in Moscow remain reluctant to systematize and apply many of the lessons taught by the two Chechen wars, analysts said. “Some elementary lessons have been learned, but they don’t amount to a reform. Apart from a sobering effect, these campaigns have had no impact,” said Vitaly Shlykov, a former deputy defense minister and one of the country’s leading independent military experts. 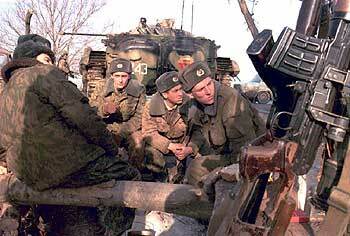 The initial stage of the first Chechen war was disastrous. Given little time to prepare or plan, Defense and Interior ministry troops were ordered to march into the rebellious republic on Dec. 11, 1994, to pay a bloody price for the self-confidence of their superiors in Moscow. The abortive storming of Grozny on Dec. 31, 1994, became, perhaps, the low point of military history in post-Soviet Russia. Armored columns roared headlong into the city’s center only to be ambushed and destroyed by Chechen fighters, proving then-Defense Minister Pavel Grachev dead wrong in his declaration that he could conquer Grozny in two hours with one airborne regiment. Hundreds of soldiers fell that New Year’s Eve, and grotesque images of the charred corpses of tank crews filled television screens across the world. The war dragged on for 20 months, taking a heavy toll on ill-prepared troops as ground commanders were first granted little time for reconnaissance and planning, and then ordered to stop their offensives every time the Kremlin decided to seek an armistice and negotiate. Also, the armed forces were severely undermanned at the time, causing many units to be assembled on the ground. Many regiments consisted of companies that had been deployed from different ends of the country and had little time to train together. There was even less coordination between the Defense Ministry troops and Interior Troops on the ground, leading to cases of friendly fire and hindered operations. The two agencies’ troops also reportedly had communications systems that were incompatible and prone to interception by Chechen fighters. The situation was further exacerbated by the fact that most of the ranks were filled with teenage conscripts who were psychologically unprepared for the brutalities of urban fighting. To top it all off, commanders and their troops had been drilled to fight large-scale wars against NATO but lacked training in modern urban warfare, mountain operations and anti-guerrilla warfare. So while troops enjoyed superiority in firepower, they were armed with weapons suited for fighting large-scale wars but far from adequate for local, low-intensity conflicts. As a result, troops suffered numerous casualties even after they had conquered all Chechen settlements because they were unable to counter the rebels’ guerrilla tactics. The first campaign ended in August 1996 with the signing of a cease-fire that many Russian commanders saw as a humiliating defeat. More than 5,500 servicemen were killed in the campaign, while up to 52,000 were wounded and some 3,000 remain missing, according to Nezavisimoye Voyennoye Obozreniye, the country’s most authoritative independent military weekly. The second campaign only started exactly three years later, giving commanders in the Defense Ministry, the Interior Ministry and the Federal Security Service — collectively known as the power agencies — plenty of time to discern and study the bloody lessons of the first campaign. The military and political leadership managed to discern many operational and tactical lessons from the first war and apply them to the second, most importantly the need to accumulate sufficient forces and supplies before launching an operation. Commanders also have more professional soldiers in their units and deployed a larger number of established units with better training. Unlike the first war, commanders refrained from setting any public deadlines for their advances and insisted that minimizing military and civilian casualties was a priority. Battalion and regimental commanders have been given more leeway to make decisions and request fire support and other assistance, allowing their units to react in a more timely manner to the hit-and-run operations of their foes, analysts said. “On a tactical level, this experience has been and is being analyzed to define what should be the best tactics, but on higher levels, the military leadership has not tried to extrapolate this experience on the entire force,” said Ivan Safranchuk, head of the Moscow office of the Washington-based Center for Defense Information. Also, federal commanders this time around have been more willing to share the burden of fighting with Chechen loyalists. Chechen units such as the Vostok and Zapad battalions, which are comprised of Chechens and operate under the aegis of the Main Intelligence Directorate of the General Staff, have proved to be effective in search-and-destroy operations, Shlykov said. However, while relying on loyalists, federal troops and security forces continue to commit human rights abuses, ignoring an important lesson of all low-intensity conflicts: the need to engage civilians through assistance and protection and thereby reduce support for the insurgents, he said. Another lesson learned in the first war and applied in the second was the need to wage war not only on the ground but also on the front pages of newspapers and, more importantly, on television, which remains the biggest source of news for Russians. The first war was extensively covered by Russian television channels, which often had to rely on rebel propaganda chief Movladi Udugov for information because military commanders sometimes stonewalled the media. Having seen the critical coverage of the first war turn the tide of public opinion against them, the military and political leadership did their best to suppress criticism and limit the access of independent media to Chechnya. A special information center was set up to hold regular press briefings to feed the official version of operations to the media. At the same time, efforts were taken to suppress Chechen rebel news outlets such as the Kavkaz web site. While many operational and tactical points of the first war have been discerned, strategic lessons from both conflicts remain unlearned, military experts said. There has been no systematic effort of the power agencies to conduct a comprehensive analysis of the first war and develop recommendations on how to fight such local conflicts, they said. “Only bits and pieces have been analyzed and learned … most of them on the tactical level,” said Vadim Solovyov, editor of Nezavisimoye Voyennoye Obozreniye. Indeed, a survey of the Defense Ministry’s own publications, such as the Army’s Armeisky Sbornik magazine, reveals a number of thorough and rather objective articles analyzing the experience of one or several units of one of the branches of the armed forces operating in Chechnya, but no comprehensive analysis of the entire campaign. Perhaps as a result, the Defense and Interior ministries have failed to procure either high-precision all-weather nighttime-capable systems or upgrade and standardize their antiquated command and control systems, analysts said. The lack of such defense systems has forced ground commanders to apply firepower indiscriminately or send subordinates to do a job that could have been carried out by nighttime all-weather systems or drones. The lack of nighttime all-weather attack systems made it impossible for the Chechnya command to provide substantial air support to the 6th Company of the 104th Regiment of the Pskov region-based Airborne Division when it was attacked by a large group of rebels in Chechnya’s Argun Gorge in February 2000. No helicopters could have operated at night, and daytime operations were hindered by fog. A deputy company commander became so desperate that he called artillery fire down on his position, according to the Almanac of the U.S. Army Combined Arms Center Military Review. In the end, it was the heroism of the company’s personnel that allowed federal troops to prevent the rebels from breaking out of the mountains. The company lost more than 80 servicemen in the Feb. 29 to March 3, 2000, battle. A lack of communications systems, their insufficient range and their vulnerability to interception and incompatibility with other federal systems have made it difficult for military brass to coordinate troops’ actions, leading to cases of friendly fire or, worse, ambushed units being unable to call for help. Without encrypted systems, rebels have been able not only to intercept communications but also break into them and issue confusing commands to units under the guise of being Russian commanders, according to reports in the Russian press. Despite these failures, federal troops incrementally established formal control over the entire territory of Chechnya by the end of 2000, and the military phase of what the Kremlin described as a counterterrorist operation was proclaimed over. Since then, troops have wisely refrained from carrying out large operations, preferring instead to dispatch small groups of commandos on search-and-destroy missions while leaving the local police in charge of maintaining law and order, analysts said. While the active phase of the second campaign is over and the shortages of up-to-date weaponry and communications systems have become less visible and acute, the armed forces will face a big problem if another local conflict emerges, warned Konstantin Makiyenko, deputy head of the Center for Analysis of Strategies and Technologies, the country’s leading independent conventional arms think tank. The power agencies’ procurement budgets have been steadily growing in recent years, but the federal forces operating in Chechnya continue to mostly rely on the same weapons as their fathers did in Soviet times, Makiyenko said. While the amount of money earmarked for arms procurement and defense research now equals the proceeds from arms exports, the armed forces receive far fewer new systems each year than foreign clients, raising questions about how efficiently the money is being spent, he said. The current procurement budget is still dominated by orders for strategic systems to fight a global war and insufficient sums for the development and purchase of nighttime, all-weather systems and up-to-date command, control and communications systems, which are needed to fight local conflicts with minimal casualties, Makiyenko said. This procurement policy results from the inertia of top commanders who were trained to fight a global war with NATO and the structure of the defense industry, which was built in Soviet times to produce weapons for such a war, said Shlykov, who served in the Soviet campaign in Afghanistan. The failure to procure state-of-the-art weapons also reflects commanders’ “mentality, which is based on the assumption that personnel are still expendable,” he said. As of August, a total of 5,362 federal servicemen had died in the second Chechen war, Vlast magazine reported, citing official data. Independent experts assert, however, that the actual death toll is much higher. The respected Union of Soldiers’ Mothers Committees estimates that some 11,000 servicemen have been killed and another 25,000 wounded. It puts the civilian death toll at about 20,000 people.